In what seems to be a current trend in the Indian jobs scene, as many as 1500 job offers extended to campus graduates were withdrawn by L&T Infotech. Close on the heels of Flipkart deferring the joining date of up to 80 campus hires by 6 months citing internal restructuring, infrastructure giant L&T Infotech has withdrawn job offers for 1500 students. 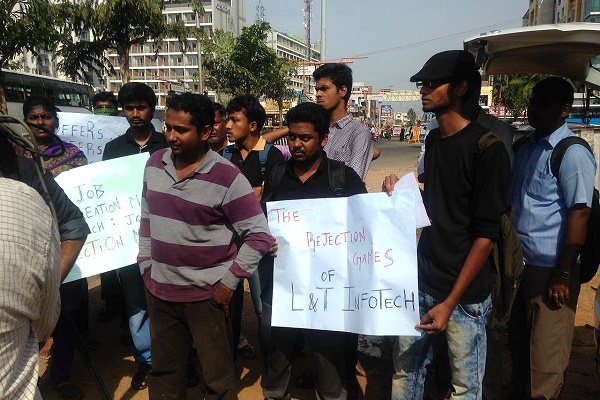 The distraught students were seen protesting around the L&T campus in Chennai and have reportedly gone on a hunger strike. “If you take the rules and regulations of all the colleges in and around Tamil Nadu into consideration, once you have got a placement in one company, you cannot apply or sit for another placement. So we got only one chance. The mail we have got now says your performance is not up to the mark, so your offer will be cancelled,” a student claimed. Last year, we had reported that L&T had hired students off campus after rigorous rounds of recruitment, but never sent them a joining date. This trend is a concerning one, and would impact the future hiring propects of such companies. The students, however, have the more pressing concerns of pending education loans, family commitments, and an uncertain future.